Good Friends, Great Food & the Pursuit of Happiness! One hot 4th of July, under the dappled shade of a huge elm, Ben Franklin, Thomas Jefferson, and John Adams sit together at a picnic table sipping cold beer, discussing the pure benefits of food & spirits, while their families relax and play around them with laughter. George Washington turns from the hot coals of the fire with a platter of burgers, “Who’s hungry?”—and the feast begins. That’s how we’d like to think it happened. This scene conjures that sense of family and friends, gathering for fun in our own backyard, and chowing down on some great food, sprinkled with love for history, the pure beginnings of the Founding Fathers, and the birth of this great country. This is what Founders Tavern & Grille is all about! 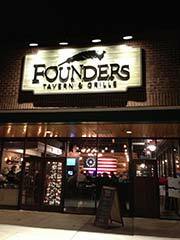 While we give a nod to that history, Founders Tavern & Grille lives in the modern day and was established in 2013 by local business owner and executive chef, Steve Sumner, and his wife, Janet, along with their good friends, the Lane family. We designed and created a space that is warm and welcoming—a place where friends and families could gather, relax, feel at-home, and enjoy some good ol’ fashioned comfort food, taken to the next level of course. Our recipes are carried down from family, perfected through years of cooking and a passion for fresh ingredients. There's something on our menu to please everyone. We pride ourselves on our fresh ingredients, and as much as we rejoice in the friends we have around us, we also rejoice in the food we have around us. The best and freshest food is what's grown closest to you… we hold this truth to be self-evident! That is why Founders strives to provide the best quality, locally-sourced ingredients to our customers, and work with those who share in our same philosophy and support the same mission. We have partnered with local meat and seafood suppliers, Chesapeake Farm to Table, Bear’s Honeypot, Schillinger’s Farm, Maryland Seafood, Dudek Butchers, and even get our organic coffee and teas from Chesapeake Bay Roasting Company who started an H2O initiative contributing a portion of their sales to clean up the Chesapeake Bay. Our commitment is to source local, organic & GMO-free. Our beef is all fresh, no steroids, no antibiotics. Our bacon is nitrate free. Our eggs & chicken are free-range & hormone-free from the Eastern Shore. All fresh local ingredients wherever possible to give back to the community. We make our own homemade sauces, dressings, desserts, nothing frozen; we actually have no freezer on the premises. Our pizza dough and bread are made in-house fresh daily from our own unique recipes. We bake our bread fresh every morning. As a modern day tavern we also have the honor to offer over 100 Whiskey & Bourbon offerings for your merriment. We offer fine wines, and over 20 craft beers. Our signature craft cocktails are made with fresh herbs, seasonal spirits, and premium ingredients; because when you come to Founders we want you to share in a unique fun tasting experience. We truly are that neighborhood Tavern. So won't you join us, raise a glass, and toast… to Good Friends, Great Food and the Pursuit of Happiness! Hope you enjoy the offerings ~ Cheers!